In 1884, Paul Nipkow, a German inventor, while still a student at the university, proposed and patented an electric telescope for the electric reproduction of illuminating objects, but he never built a working model of the system. The idea came to him while sitting alone at home with an oil lamp on Christmas Eve, 1883. Alexander Bain had transmitted images telegraphically in the 1840s but the Nipkow disk improved the encoding process. Nipkow recounted his first sight of television at a Berlin radio show in 1928: "the televisions stood in dark cells. Hundreds stood and waited patiently for the moment at which they would see television for the first time. I waited among them, growing ever more nervous. Now for the first time I would see what I had devised 45 years ago." Constantin Perskyi coined the word "television" in a paper read to the International Electricity Congress at the International World Fair in Paris on August 25, 1900. On March 25, 1925, Scottish inventor John Logie Baird gave the first public demonstration of televised silhouette images in motion, and on January 26, 1926, the world's first demonstration of a working television system. In 1927, Baird transmitted a signal over 438 miles (705 km) of telephone line between London and Glasgow, and in 1928, his company (Baird Television Development Company/Cinema Television) broadcast the first transatlantic television signal, between London and New York. In 1928, Baird introduced the first commercially made television sets in the UK: the "Televisor" It was available with or without radio and consisted of a neon tube behind a mechanically spinning disk (the Nipkow disk) with a spiral of apertures that produced a red postage-stamp size image, enlarged to twice that size by a magnifying glass. 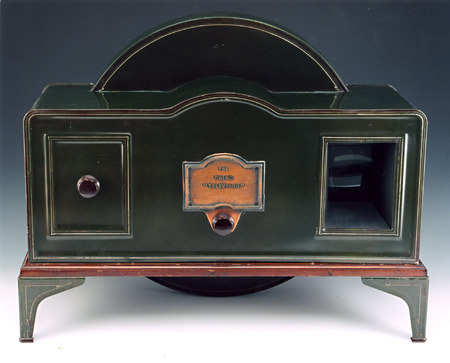 The Televisor sold in 1930–1933 is considered the first mass-produced set, selling about a thousand units.